Maremma, Southern Tuscany: An area between the Tyrrhenian Sea and Mount Amiata, where Sangiovese is the focus of production, in concert with native and international varietals like Ciliegiolo, Alicante, Syrah, Cabernet Franc and the white Vermentino. Poggio Argentiera is a winery of 22 hectares where respect for the vines and the landscape where they grow is the core philosophy. Poggio Argentiera was born in 1997 with the purchase of Podere Adua (which today gives its name to a label) and of the first 6 hectares. Back in 2001, the company expanded, purchasing Podere Keeling, in the municipality of Scansano. The year 2009 marked an important change: The entire winery transitioned to organic practices. The principal winery is located in the area adjacent to the Natural Park of Maremma, in the hinterland of Marina di Alberese. The vineyards are at sea level, which is only a few kilometres away. Here, the soils are mainly sandy loam, with a little clay and minimal organic material. Podere Keeling has a different situation, located at a higher altitude on the hills above the town of Scansano. The landscape’s natural inclination, exposure and pebble-rich soil composition, results in vineyards of extraordinary charm. 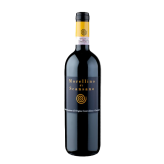 The Bellamarsilia Morellino di Scansano DOCG is one of two Morellinos produced. A blend of Sangiovese and Ciligiolo, it is a bright, exuberant wine that proudly heralds the traditions of the Maremma.